All Katniss Everdeen wants to do is live a quiet life in the rural backwater of District 12, but when her younger sister is selected as one of the competitors in that year's Hunger Games, Katniss volunteers to go in her place. Most people don't give her a change of surviving the Hunger Games, a gladiatorial contest where teenagers from across the twelve districts are forced to fight to the death in televised combat as a reminder of the subjugation of the districts to the distant Capitol, but they may be underestimating Katniss' resourcefulness. This series has been getting a lot of hype recently, and although this book is not without its flaws I thought this was a very entertaining read. The basic premise isn't particularly original (it's especially reminiscent of the ultraviolent Japanese film Battle Royale), but it does make for a compelling story. The world-building leaves something to be desired, it's not very detailed or convincing and the bad guys are cartoonish villains, but this doesn't detract too much from the book since the core of the story takes place inside the Arena which is meant to be an artificial setting. The writing quality is acceptable, although unexceptional. Katniss is a good protagonist, she's a believably flawed character and although not immediately likeable or conventionally heroic she does make a good hero for the story, facing her trials with quiet determination and it's difficult not to sympathise with her. Peeta is also an interesting character, although possibly more so when his true motivations haven't yet been revealed and Katniss' irascible mentor Haymitch is the most memorable of the supporting characters. Since the novel is from Katniss' viewpoint the rest of the supporting cast don't get much development, possibly it could have benefited from knowing a bit more about some of her other opponents. It's quite a manipulative story, which makes sense for something based on an extreme version of reality television, although the will-they-won't-they romance is a little bit irritating at times. The build-up, including the first part of the Hunger Games, is relatively slow as Katniss largely tries to avoid her fellow competitors but it does become compelling as the contest moves into its final stages. The best character interactions come as she forms alliances with Rue and Peeta and there are a number of tense scenes towards the end of the novel as Katniss and her allies try to survive the increasingly sadistic arena. 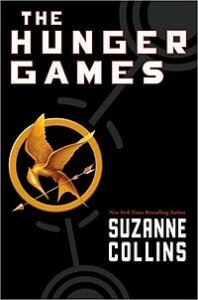 In summary, The Hunger Games is perhaps not a great book, but it is an enjoyable and memorable read.